Summer's colors are light, soft, and cool. In all three Summer palettes, you will find many light, greyed tones of green, blue-green, blue, blue-purple, purple, and violet. You will see few or no reds, oranges, yellows, or pure hues, and few dark colors. 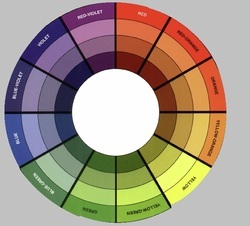 Color wheel with (outside to inside) pure hues, lightened tints, greyed tones, and darkened shades. The energy of Summer's look is calm, graceful and restrained. Summers whose overall coloring is very fair or very light tend to be Light Summers.